But still more important may have been the sensation evoked: joyful discomfort. Byrne looked like he was drowning in fabric, which seemed to retroactively explain why he always danced as if encased in gel. Yet the awkwardness was charming, like a kid trying on her dad’s jacket. Byrne, at long last, has scrapped the essential trappings of a rock show. There’s no drum kit centering the eye. No amps stand like boulders. Rather, the musicians serve as the only furniture—and they move. Most play marching-band style, strapping their bodies with keyboards or a museum’s variety of percussion instruments (most concertgoers will struggle to identify the devices being thwacked and scraped). Each performer is also a performance artist, moving their feet and sticks in preplanned patterns. Joining them are two dancers, one of whom resembles Veep’s Matt Walsh in cabaret makeup. 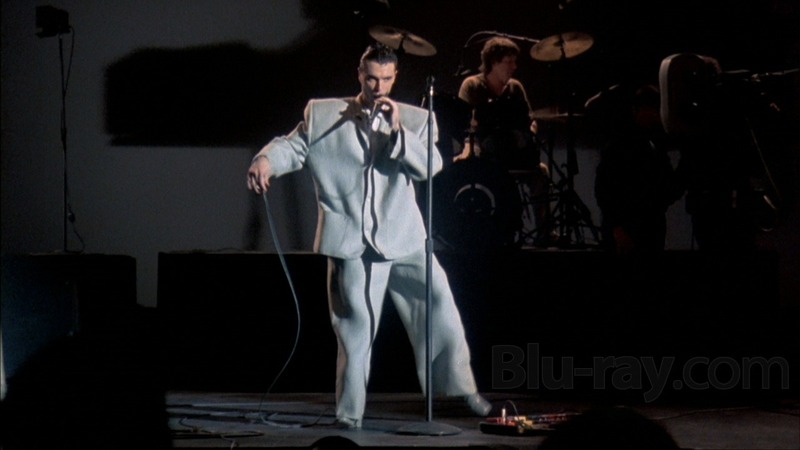 Would it surprise anyone familiar with the Talking Heads to learn that the choreography is all stiff funk, graphical poses racked by jitters, people facing opposite directions or at perpendicular angles, and the robotic reinterpretation of wedding-party moves? The first chorus of Byrne’s recent American Utopia goes, “I dance like this / Because it feels so damn good,” and in concert this looks like a ritualistic hitchhike. Across the stage, the ensemble variously clusters and reassembles, sometimes receding behind the beaded curtains, sometimes peeking out from them, sometimes treating Byrne as leader, and sometimes ignoring him. Everyone is ebullient, but none more than the dancers Chris Giarmo and Tendayi Kuumba, who come off like aircraft marshals on ecstasy: sweaty, grinning, speaking with their arms. The most potently jarring moment, at least in Boston, came when his love for that which does not quite fit was used for political ends. In the show-closing second encore, the ensemble covered Janelle Monáe’s “Hell You Talmbout,” a sternum-rattling chant memorializing black people killed by racist violence or state force (or both). The troupe became a protest line, standing shoulder to shoulder, shouting out names like Walter Scott and Trayvon Martin, and implicitly asking the audience to do the same. Yet that audience—largely white, largely middle-aged—didn’t, as far as I could tell from where I was standing, shout back the names with any great unity or intensity. Maybe they didn’t understand the point of the song, or maybe they didn’t feel at ease participating. By the end, the divide between the thunderous energy from the stage and the meek rejoinder from the pit almost felt like the point. It highlighted why the song needs to be sung in the first place: to demand not only remembrance for the slain, but also reflection on the difficult question—especially for those caught off guard by the chant—of what to do about them. And it was a reminder that discomfort charged by passion is not only the emotional mix preferred by Byrne, but also, perhaps, the only kind that ever leads to change.